What should you consider within an effective Sales Enablement process? Head of Inbound Sales, Fes, outlines tips for sales enablement and sales process design, to accelerate time to conversation and opportunity. You can also view the full video here. Hey guys, Fes here from Strategic IC. Another video in our series on actionable tips for B2B sales and marketing teams. This series is in support of our B2B breakfast sessions, we're running a session with Steve Vaughan from HubSpot. We'll be talking about the value of sales and marketing alignment and how marketing can help sales generate more early-stage conversations. Note: this September 2018 event has now passed, however the tips included in this article remain relevant. So off the back of that, this topic is on sales enablement. 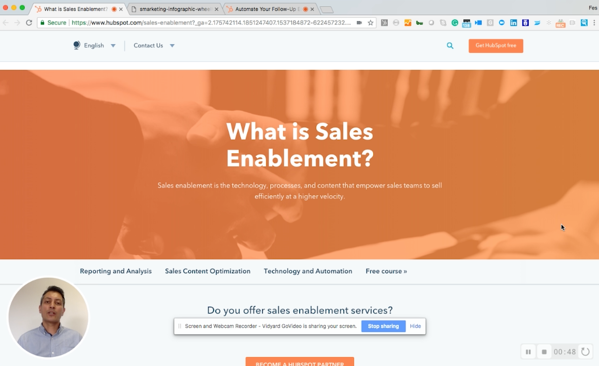 Now you may or may not have a sales enablement function within your business, so to provide some context here, HubSpot's definition of sales enablement is the technology, processes and content that empower sales teams to sell efficiently at a higher velocity. Some of the key principles here are giving a voice to sales, marketing, products and perhaps customer success to design a process that helps sales to move a buyer from a prospect to a customer more efficiently. And some of the key considerations there, are in the areas of process design, and reporting and analytics. So having the right technology stack to be able to design a process for sales, implement that process, and then evaluate the data from that process to make improvements and optimise the results for that process. And then looking at the overall sales process, looking at the buyer journey, the stages in that buyer journey, and making sure sales and marketing are clear on how they can impact the buyer's journey through content and messaging, to accelerate the time to sales conversation, and time to opportunity and customer. We also ought to consider here which contacts and accounts the sales team are focused on, making sure that they have insights on accounts and contacts that are showing propensity to buy, engaging with your website and converting on your content. So lastly, here is the point on content, There's a lot of content being created by organisations; how much of it is actually being used by the sales team? And when they are using it, all using it is impactful? How do you report on the impact from the sales team promoting content to the buyer? Is it resonating with the buyers? Why Consider Your Sales Enablement Process? So these are some key considerations on sales enablement at the very high level. Now, I'll talk about quickly the 'why', what's the purpose of this? 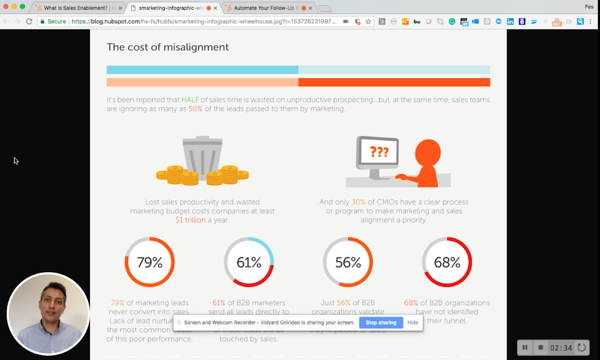 Well, there is a cost of misalignment between sales and marketing. Not connecting the dots between the story that marketing is telling to the buyer and their acquisition of leads into the database. But also, the story once sales picks up the baton from marketing. Is that storytelling cohesive? Is it helping to pull the prospect or buyer along the journey and aligning with your value proposition? Secondly, is the sales team working effectively? Half of the sales team's time is often wasted on unproductive prospecting. And also is the sales team actually ignoring some of the leads that are being generated - ignoring up to as much as 50 percent of the leads being passed to them by marketing. So I just want to touch on one key area of this. It is focusing on the buyer. Now all of the sales and marketing processes are driven around these guys. It's the who, why, what, and when. This is a buyer persona matrix. It helps to align sales and marketing teams around the key contacts within the decision-making unit. As your product gets more complex, the number of contacts within a decision-making unit is going to increase. So you need to be aware of who you need to engage, at what stage and with what message. It's not always about promoting your product USPs. It's also about evaluating the buyer's challenges, helping them to understand how to build the business case for change within their organisation. And that's where sales teams nowadays, particularly in complex sales, are making the most impact. So how do you actually enable sales teams with technology and insights? Well, HubSpot has a suite of tools. One of those tools is sequences. Now sequences is almost process design and execution. 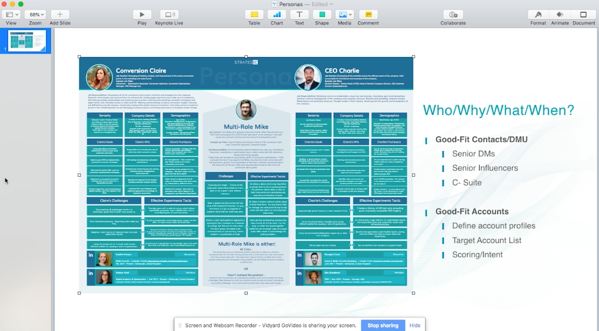 And what I mean by that is HubSpot have created a tool that allows you to template emails and then combine that with tasks. So you create a process for the sales team, you create template emails, you create tasks such as calls and outreach on social channels. And what you're doing here is enabling the high performers with automation to give them more time to focus on deal closing, and you're enabling the low performers with the messaging that you know works. It goes back to that 'what messaging is the sales team using?' and not having everyone promoting different messages to different prospects. Everybody's aligned, they're working to the same message, same story, same processes. You can then measure where success is. You can identify the gaps. And you can see where things aren't working. And then you can start to make improvements to the processes. A big part of this is automation combined with personalisation. Engagement comes through connecting with your buyers at that one to one level. So you're not just templating emails and promoting that to the audience. You need to show the sales team how to use personalisation, where they gather personalisation insights. And perhaps at this stage, if it's an inbound lead and the first follow up, you only need about 20 percent personalisation in the follow up process. Lastly, you want to take the process and be able to report on it. What's working? And create the data and insights not only for the management team, but also for the individuals. Help them to see where success is. What are members of the team doing that's giving them success and how can they improve their email personalisation, their calls and the frequency of their follow up to generate the results that they want to see to help them meet their goals. So in summary, we want to use automation, technology, and personalisation to give sales teams the power to engage prospects and buyers at scale, but with a message that's going to resonate with buyers. And we want to really take into consideration the buyers and their challenges, and their internal processes, and align the messaging with their buyer journey. And help the sales team to accelerate that time to sales conversation and accelerate time to opportunity. I hope that helps. This was a really quick overview, so if you have more questions, get in touch. Or perhaps you can attend some of our events over the next couple of months. Thanks.